John Olmstead‍ has seen plenty of Notre Dame this fall and he’ll see more in the days to come. In addition to seeing the Irish play a home game in South Bend, the 2019 offensive line commit watched them play on both coasts and hasn’t even taken his official visit yet, which he will do for this weekend’s banquet. “It was awesome,” Olmstead said of his travels to see his future squad in action these last few months. “I got to go to three games this season, which was kind of nice. I went to the Michigan game. I was at the Yankee Stadium game because it was so close. I went out to see the USC game on my own dime. The North Brunswick, N.J., native is hoping it gets better over the next month. 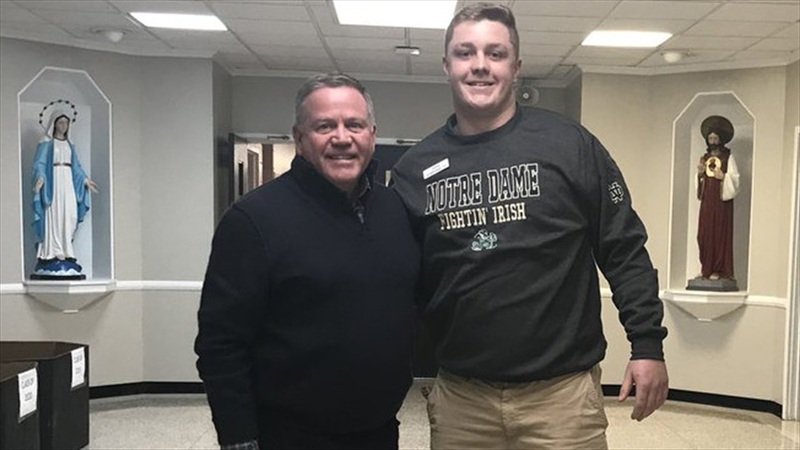 Last week, Olmstead was able to host Irish head coach Brian Kelly, offensive line coach Jeff Quinn and defensive line coach Mike Elston at St. Joseph High School. “It was awesome,” Olmstead of having the head coach of Notre Dame at his school. “He spent a lot of time at the school. He got to meet my head coach for the first time, which was really cool. It was awesome for his presence to be in the school. Olmstead will be up in South Bend for good soon as he’s one of several 2019 commits who will enroll next month. “Usually, most of the Catholic schools around here don’t allow their athletes to do that,” he said. “I’m actually the second person from my school ever to do it. The first was actually Karl Anthony-Towns. It was a big decision. It took a while for the process to play out to grant me permission to do that. I think it was two years. Even though it’s been in the works for years, it’s still hard to fathom that it’s now so close. “It came very fast,” he said. “I didn’t think it was going to go as fast as it did. I think I’ve got 10 more school days left. And before he reports for good, he’ll make one more trip to South Bend. “I’m taking my official this weekend,” he said. “It should be awesome. The Echoes, one of the greatest college award shows ever. It’s a big deal. I just can’t wait to go out and visit for Echoes. I’ve talked to players who have done their officials for Echoes and they said it’s the best time to go.